ISIS is losing territory it gained in 2014, and throwing a temper tantrum about it. 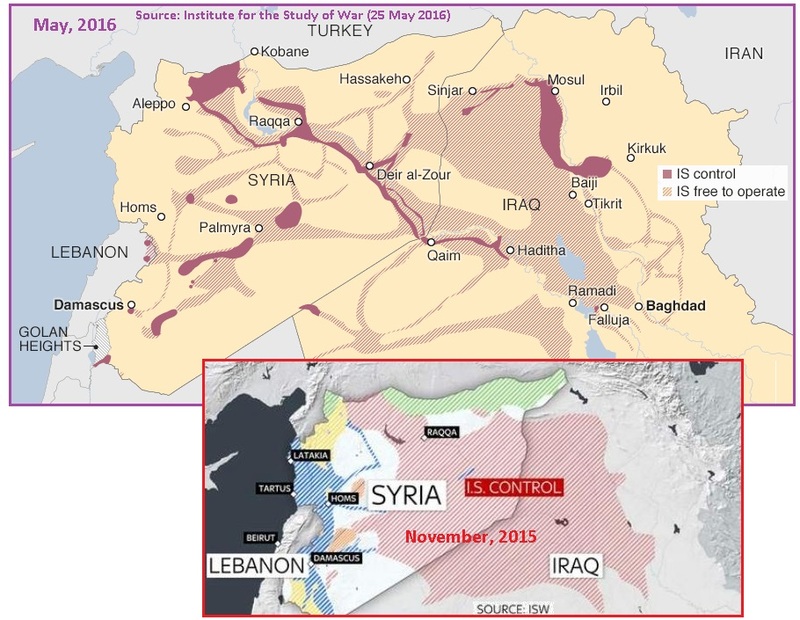 How rapidly is ISIS losing the territory it gained in 2014? Russia’s entry into the Middle East was the turning point, as they stopped Turkey from brokering oil for ISIS, thereby cutting off their funding, and worked effectively with the Kurds. The issue of the West’s push to topple Assad was put aside so that Assad’s forces could likewise fight ISIS. Meanwhile, the Iraq forces, which had turned and run away from ISIS when the conflict first started, regrouped under US coaching, and began fighting ISIS effectively. The gains made in just two years are amazing. This is a credit to Russia, who truly made this happen. Meanwhile, the politics in the region are in play. Russian President Vladimir Putin and his Turkish counterpart, Recep Tayip Erdogan, discussed the possibility of meeting in person during a phone conversation. The meeting would be their first since Moscow-Ankara relations soured after the downing of a Russian jet over Syria. On [June 27], Erdogan sent a letter to Putin to offer “his deep sympathy and condolences to the relatives of the deceased Russian pilot and said ‘sorry,’ ” Kremlin spokesman Dmitry Peskov said. In his letter, the Turkish leader called Russia Ankara’s “friend and a strategic partner,” with which Turkey would not want to spoil relations. Israel and Turkey reach deal to restore relations. Deal comes six years after an Israeli raid killed Turkish activists on a flotilla seeking to deliver aid to Gaza. ZetaTalk Insight 7/2/2016: Why is Turkey suddenly being cozy with Israel and Russia? Previously, they had been allied with ISIS, the Erdogan family brokering oil for ISIS, and shooting down a Russian jet that was trying to stop delivery of this oil to Turkey. Previously, they had been supplying arms and giving medical assistance to ISIS. 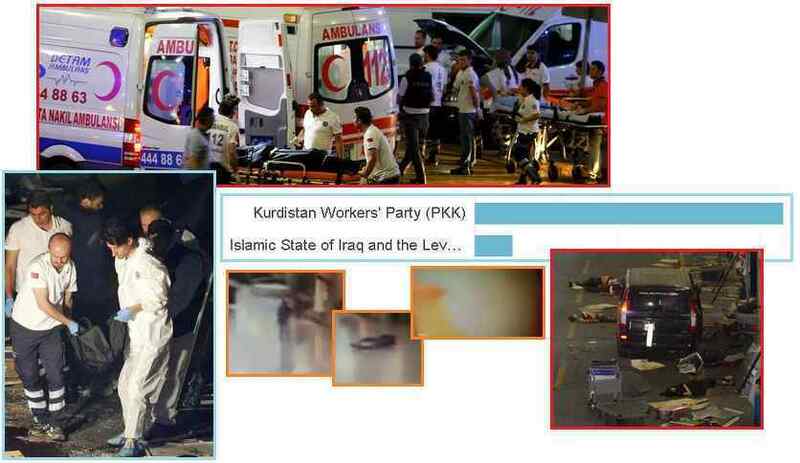 Previously, they had done everything possible to attack the Kurds, the most effective force against ISIS. Suddenly there are apologies in all directions. That the Istanbul bombing happened on the same day that Putin and Erdogan spoke on the phone, Erdogan delivering his apology, is not a surprise. What relationship does all this have with the Brexit vote? Turkey is a NATO member, but enthusiasm for one NATO country defending another, a staunch rule in NATO, has lost favor. Trump, favored to win in the US general election, has stated he would pare back the US involvement with NATO. Now with Brexit the European Union has lost funds for their common defense. Previously Erdogan seemed to be blackmailing Europe, threatening to release migrant hordes unless the EU paid him exorbitant funds. Now an EU bankruptcy seems imminent. Erdogan has switched his allegiances, hoping now that Russia will defend it against ISIS, and hoping that Israel, with their connection to the banking spheres, will be a source of funds. Instead of brokering oil for ISIS and arrogantly trying to force the European Union to pay him billions to house Syrian refugees in Turkey, Erdogan is seeking new allies. Per the Zetas, ISIS has been abandoned by Turkey, and the backlash was swift. At least 36 people are dead and 150 wounded after three suicide bombers attacked the airport. Ataturk, Turkey’s largest airport, is the main international airport serving Istanbul. Turkey has been reeling from months of attacks targeting both tourists and security forces. Self-described Islamic State militants have claimed credit for some of the bombings, while Kurdish militant groups, which the Turkish government is fighting in the country’s south, took responsibility for others. In shocking footage that captured the moment, the gunman can be seen running through the international arrivals terminal before falling to the ground - apparently felled by a police bullet - and sending his AK-47 skidding across the floor. Moments later, as the gunman writhes in pain on the floor, he detonates his bomb and the screen goes blank. Turkish Prime Miniser Binali Yildirim said in a statement that air traffic had returned to normal following the terror attack at an Istanbul airport that left 41 dead and 239 injured. ZetaTalk Insight 7/2/2016: Terrorism at the hand of ISIS has increased in Turkey in step with Turkey’s reluctance to continue to support ISIS. As Russia has pointed out, in fact proven, Erodogan’s son was brokering oil for ISIS, by this funding ISIS terrorism elsewhere while enriching the Erdogan family. This was the reason Turkey shot down a Russian jet near the Turkey border. Now, six months later, Turkey has belatedly apologized to Russia. Last April, the US evacuated their military dependents from Turkey, signaling that they did not intend to defend Turkey, who was still formally a NATO member. Meanwhile, the coalition fighting ISIS in Syria and Iraq, led primarily by Russia, are pushing back the gains ISIS make in 2014, taking one city after another away from their control. Russia is in charge, assisted by the Kurds, Iraq, Syrian forces under Assad, Iran, and US and French forces during bombing runs. The Kurds, fighting for their independence from Turkey, are some of the most effective fighters against ISIS. ISIS allies in the region, which included Israel and Saudi Arabia as well as Turkey, have lost their stake in the battle. ISIS is furious at Turkey for turning its back on them, and is punishing Turkey as a result. ISIS is not only throwing a temper tantrum in Turkey, it has lashed out around the world. Russia aborted an attack near Moscow on July 2. 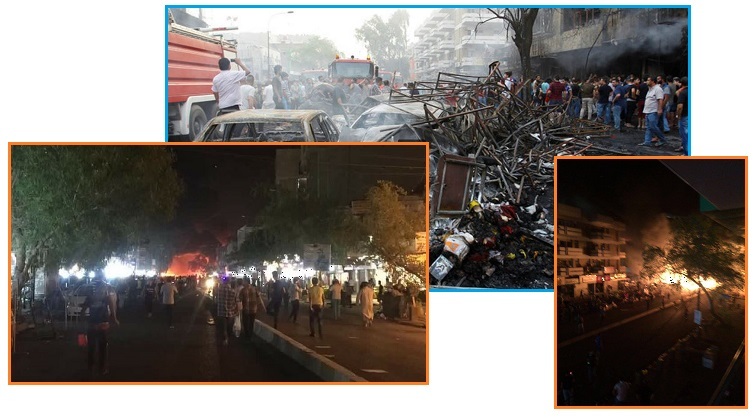 A car bomb in Baghdad killed over 200 on July 2. 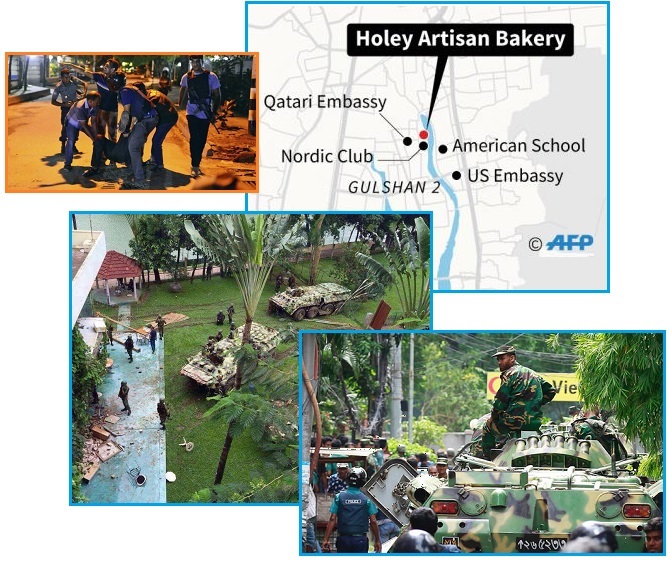 And dozens were killed and injured in a diplomat area in Dhaka, Bangladesh on July 1. A group of radical Islamists running a cover-up timber business and suspected of financing the operations of Islamic State extremists in Syria have been detained in Russia’s city of Vologda, north of Moscow. Two blasts have ripped through busy market areas in Baghdad, Iraq’s capital, killing around 80 people and injuring 160. The Islamic State militant group has claimed responsibility for one of the attacks. The first blast had come from a car bomb. Islamic State had suffered tremendous losses over the past several months and could be committing such attacks in order to avenge their retreat. Bangladeshi forces stormed a Dhaka cafe where up to 10 gunmen had taken dozens of people hostage, killing 20. Thirteen others were rescued and 6 gunmen were killed by police. Islamic State has taken responsibility for the attack. Two police officers were killed in the initial standoff with the attackers, and 30 people were wounded, mostly from shrapnel. The attack was the latest in a series of killings by Islamist extremists that have rocked Bangladesh, a Muslim-majority country, in recent months. The Islamic State is known to have claimed responsibility for 18 other attacks in the last year, most perpetrated against religious minorities, including Hindus, Buddhists and Christians. Meanwhile, the refugee problem in Syria remains intense. As ISIS is pushed back, the refugees who fled the conflict can return to their homes and resettle. Refugees had been used as a cover for ISIS fighters invading Europe and the US. 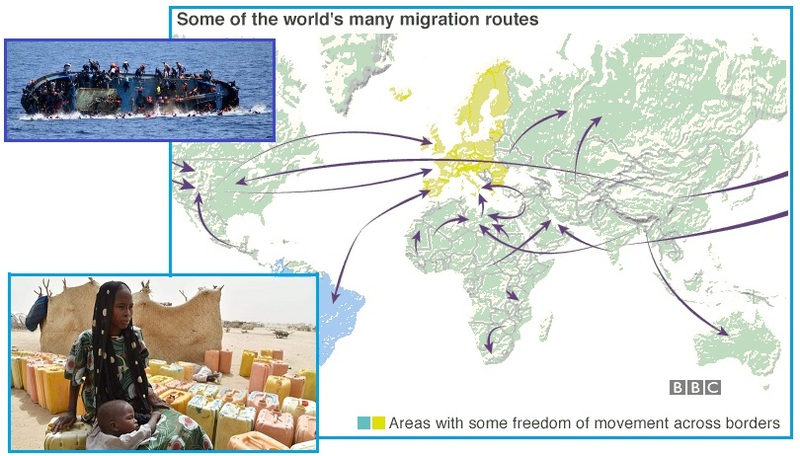 But there is still work ahead, to reverse the refugee flow so that Syria can heal. Refugees at highest ever level, reaching 65m, says UN. Turkey is the biggest host country for refugees worldwide, with 2.5m people, followed by Pakistan and Lebanon. Why did Bill Clinton jump Loretta Lynch on June 29, 2016? Bill manipulated the situation, arranged to be late for takeoff, and boarded Lynch's plane, uninvited. Per the Zetas, he hoped to compromise Lynch, so she would be forced to assign an Independent Prosecutor on any Clinton Foundation public corruption charges, which would cause a delay of months. Why the crunch now? Per the Zetas, Hillary has been offered a plea deal, and has only days to accept or reject. No negotiations. She must leave the campaign, or the Clinton Foundation and she herself will be indicted for Public Corruption. 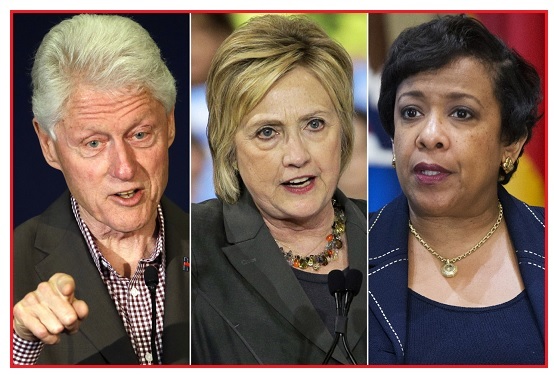 Judicial Watch today requested that the U.S. Department of Justice Office of the Inspector General investigate the meeting yesterday between Bill Clinton and Attorney General Loretta Lynch. 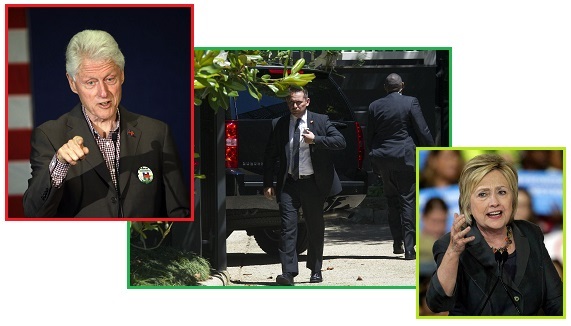 ZetaTalk Insight 7/2/2016: Lynch did not invite Bill Clinton, he jumped her. Her schedule was known, her landing time easily determined, and he set about boarding her plane to deliberately smear her integrity. It was not by accident that Bill Clinton was there at that time. Could Lynch have rebuffed him? This is essentially what she did, telling a reluctant Bill that he had to leave immediately, but Bill does not end a conversation quickly. What was his purpose during this invasion? He hoped to force the DOJ to assign an Independent Prosecutor, a move which would delay any indictment by months. Meanwhile, under Dunford’s direction, the indictment is proceeding. On June 22, when Hillary was briefly in Washington DC supposedly to talk to Congress folk, she was meeting with the DOJ to accept or reject a plea deal. It was notable that she was not on the stairs of the Capitol Building with Pelosi during the gun sit-in. This was an ideal photo op, carried on major media, yet no Hillary. Later that day, on a campaign stop, she looked teary and distressed. This week her health problems have returned, another coughing fit, and in LA on June 29 her eyes were bloodshot and she looked exhausted and worried. This was the clear body language last December, 2015 also, when Obama obviously delivered bad news to Hillary during their luncheon at the White House. Obama looked ashen afterwards, and Hillary appeared to be pleading and teary. Now that look is back. Per the Zetas, what the media reports and what is actually going on behind the scenes are not aligned, as the talking heads in the media are not in the know. Dunford is in charge in the US, not Obama, and Dunford was not going to allow the criminal Clinton family back into the White House. Dunford thus proceeded to prosecute Hillary via a type of Court Martial approach. Because Hillary kept evading an FBI interview, she was subpoena’d months ago. The meeting in DC on June 22 was to offer her a plea deal. The supposed FBI interview on July 2 in DC was just a cover for the final plea deal meeting. Thus Bill Clinton felt he was running out of time, as he wants both Hillary in the White House and the Clinton Foundation free to rake in cash, and sought to force Lynch to assign an Independent Prosecutor. Then in what could only be described as a well coordinated script, FBI Director Comey called a press conference on July 5, to give a detailed account of how the FBI investigated Hillary's homebrew server, his opinion on what they found, and his recommendations that the DOJ not pursue an indictment. His full transcript is available. What was notably missing was any mention of the dual investigation of the Clinton Foundation, a subject Comey also avoided during a July 7 Congressional Hearing on the matter. ZetaTalk Insight 7/9/2016: What is to be made of Comey’s statements on July 5th, declining to recommend prosecution of Hillary over her homebrew email server setup? Notably missing during his very detailed explanation of the FBI process in this matter was any mention of the Clinton Foundation, which is under investigation for Public Corruption, a situation where a public official sells public assets for personal gain. There are two investigations that emerged as a result of the FBI confiscation of email scraps and deleted email on Hillary’s homebrew server. 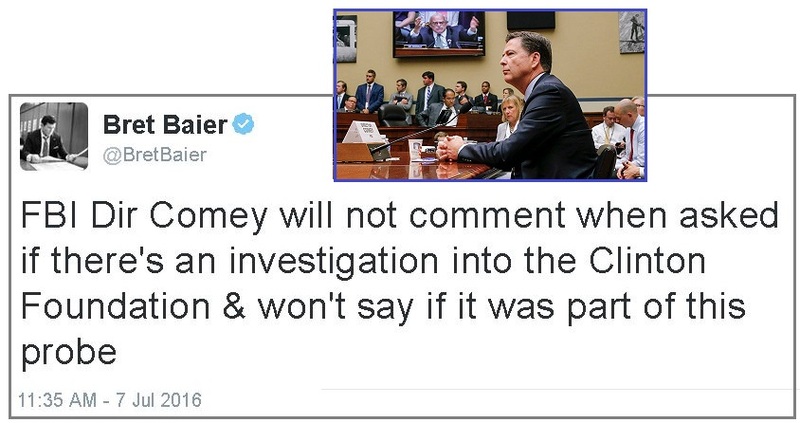 Only the server setup was addressed on July 5th by Comey. As Comey noted, Hillary and her staff were “extremely careless” in their handling of state secrets on email, but hard proof of intent to break the law was lacking. Historically, the vast majority of such cases are not successfully prosecuted. Thus, his recommendation. We have stated that Hillary was offered a plea deal on June 22nd when she was in Washington DC. Comey had obviously decided not to recommend indictment by that time, so why the offer of a plea deal? This shows that the big deal was not the server setup, but Public Corruption. A second clue is Bill Clinton’s distress, his obvious attempt to delay any prosecution of the Clinton Foundation by suddenly boarding Lynch’s plane in Phoenix. He sought to publicly discredit Lynch’s integrity and in doing so, to force Lynch to assign an Independent Prosecutor, causing months of delays and allowing Hillary time to gain the White House. The Clinton Foundation is Bill’s playground, while the White House is Hillary’s ambition. Bill is not particularly interested in being First Gentleman, at Hillary’s service. If the Clinton Foundation was sued under the RICO act, the Clinton’s would likewise be thrown into relative poverty. We have outlined various scenarios for the 2016 elections. One was where Obama might be in place for a Third Term. This was a possibility in mid-2015 when Jade Helm was in place and the plan was for Obama to announce the presence of Nibiru, thus potentially throwing the public into panic. Then Obama lacked courage. It is still possible for the multi-pronged announcement approach in process to create panic, but it seems the public accepts these prongs without panic. Then there is the possibility of the Earth changes creating so much devastation in the US that the 2016 elections might be deferred. The New Madrid is certainly warming up, but there is scant time left for that degree of devastation to hit. What then was the plea deal offered to Hillary, and how might that play out? If it is confusing to the public to see both Obama and Biden out on the campaign trail with Hillary, consider that this is allowing Hillary to leave on a high note, due to health concerns, perhaps. It is also putting both Obama and Biden in the spotlight, to remind the public that they are both available. Dunford will not allow Hillary to gain the White House. He has numerous moves at his disposal, but this is a private matter for General Dunford and not for us to throw out on print to allay the public’s curiosity. Stay tuned, as this game is in play. 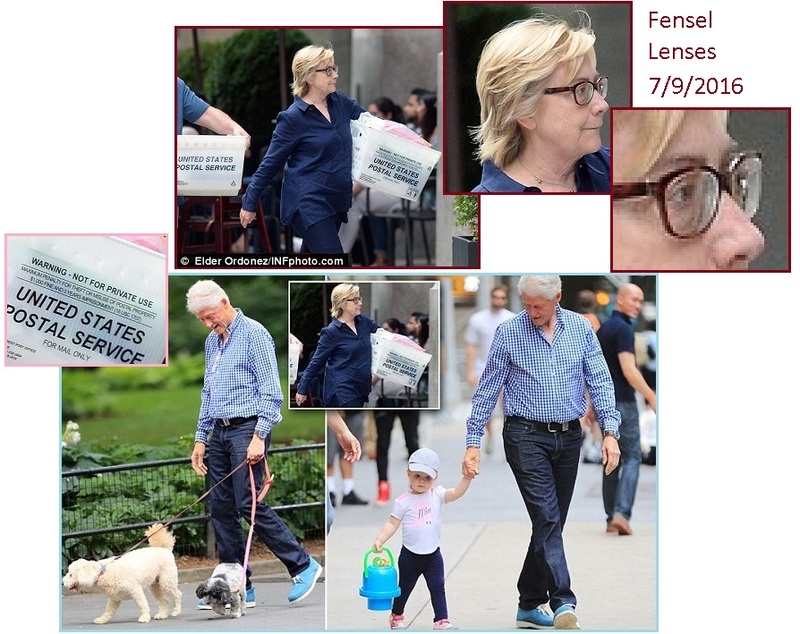 Hillary’s health has often been the subject of speculation, as she has a mysterious cough that returns, and has been caught wearing the Fensel lenses that correct the double vision that plagues MS victims, as recently as July 9, 2016 while visiting her daughter in New York City re Clinton Foundation business. 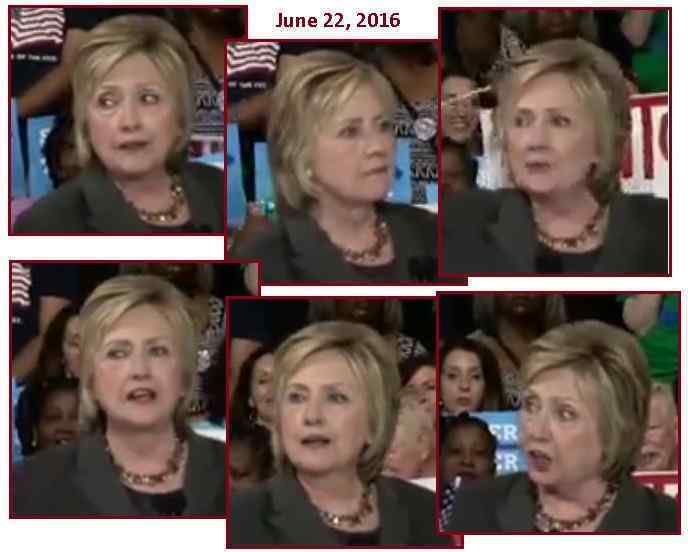 Per the Zetas, despite a doctor’s report stating that Hillary was in glowing good health, she not only has MS, she also has heart failure, brought on by her almost constant anger. ZetaTalk Insight 7/2/2016: What is the cause of Hillary’s mysterious cough, her reported fatigue, and on-and-off bloat and edema? She has heart failure, a result of her almost constant anger over the years. The major symptoms of heart failure are edema, a cough as the failing heart puts fluid into the lungs, and fatigue. 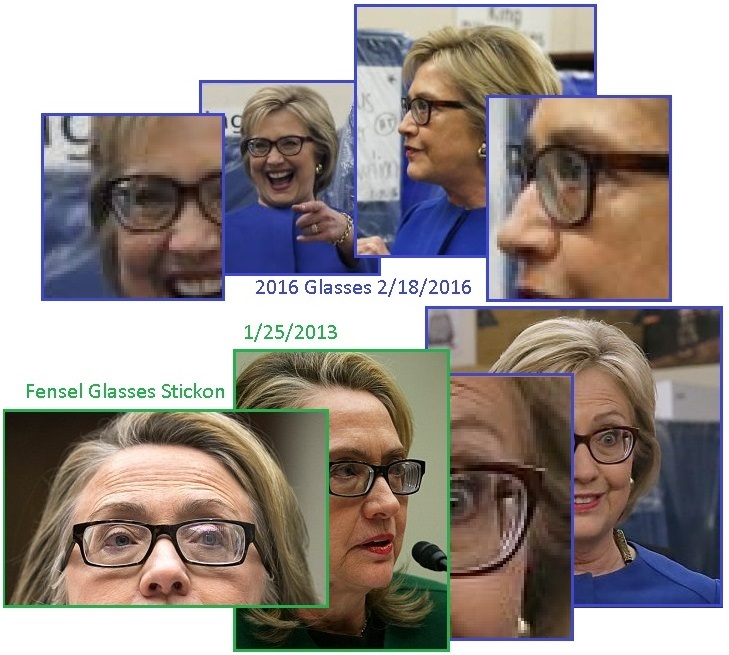 We have previously stated that Hillary also has MS, the reason for her occasional use of Fensel lenses for double vision. She takes steroids to counteract the MS, a move that aggravates her heart failure as steroids cause the body to hold water. Where is this heading, as her health and the looming indictment collide? Potentially hospitalization, or a sudden death from a fibrillating heart.